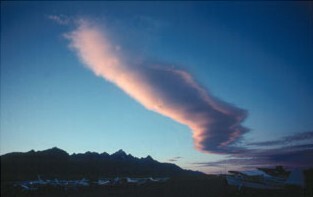 The most distinctive characteristic of the mountain wave is the lenticular cloud. This is a "signpost of the sky" indicating that mountain wave activity is present. The wave that forms over the mountain is more properly called the "mountain wave." The waves downwind from the mountain are the "standing wave" or "lee wave." Pilots have come to accept all of these names for wave activity, regardless of position of the lenticular clouds. Wind flow perpendicular to the mountain range, or nearly so, being within about 30 degrees of perpendicular. An increasing wind velocity with altitude with the wind velocity 20 knots or more near mountaintop level. Either a stable air mass layer aloft or an inversion below about 15,000 feet. Because of these elements, the weather service is able to predict the mountain wave condition with over 90-percent accuracy. 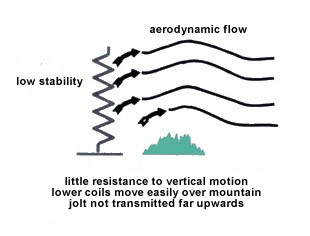 In figure 1, we have likened an atmosphere with low stability to a flimsy spring that offers little resistance to vertical motion. So while the lower coils move easily up and over the mountain, the jolt received at ground level is not transmitted very far upward. Figure 2 represents a stable atmosphere that is similar to a tough, heavy spring. This air, when it strikes the mountains, tends to suppress internal vertical motion. It is essentially too tough for oscillations to be set up. In figure 3 we have an arrangement of a strong coil sandwiched between two weaker springs to simulate an atmosphere with a stable layer sandwiched between areas of lesser stability. With this arrangement it is conceivable that the strong spring will continue to bounce up and down for some time after the parcel of air has crossed the mountain ridge. 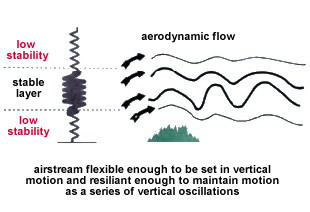 With a stable layer (or inversion aloft) the air stream is both flexible enough to be set in vertical motion and elastic enough to maintain that motion as a series of vertical oscillations. As the air ascends, it cools and condenses out moisture, forming the distinctive lenticular clouds. As it descends, it compresses and the heat of compression reabsorbs the moisture. It goes through this up and down action many times forming a distinctive lenticular cloud at the apex of each crest, providing there is sufficient moisture present for the cloud formation. The up-and-down action forms a trough at the bottom of its flow and a crest at the top of the flow. The distance from trough to trough (or crest to crest) is called the wave length. The wave length is directly proportional to wind wind and inversely proportional to stability. The wave length is used for visualization. In the area from the trough to the crest is an area of updrafts. The area from the crest to the trough is predominately downdrafts. In the intermountain west the wave length can vary from about 2 nautical miles to over 25 nautical miles. It averages 8 miles and extends downrange about 150-300 nautical miles. Satellite photos have shown the wave capable of extending over 700-nautical miles downwind from the mountain range. The foehngap exists because moisture is reabsorbed during the down rush of air. With sufficient moisture three typical wave clouds will form, although there are four types of clouds associated with the wave. The presence of clouds merely point out wave activity and not wave intensity at any particular level. 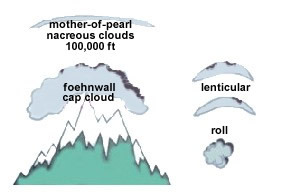 Because moist air takes less vertical distance to reach its condensation level than does dryer air, the presence of a lenticular cloud is not necessarily an indication of the strength of the updrafts or downdrafts in a mountain wave. 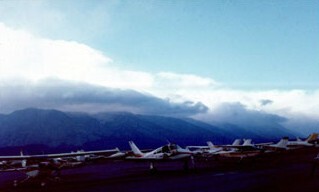 For example, high altitude lenticulars may indicate there is sufficient moisture at that altitude to form them, when in fact the strongest wave lift and sink occurs at a lower altitude where there isn't enough moisture to form the lenticular clouds. This is one reason visualization is so important. The mother-of-pearl or nacreous cloud is a pancake-shaped cloud that is extremely thin and visible for only a short time after sunset or before sunrise when the sky is dark. It is normally seen in latitudes higher than 50 degree north, or over Antarctica. It is best seen in the polar regions at 80,000 to 100,000 feet when the sun is below the horizon. The lenticular cloud appears to be stationary although the wind may be blowing through the wave at 50 knots or more. The wave lift can extend into the stratosphere, more than 10 miles above sea level, so you can't escape wave effects by flying over them. 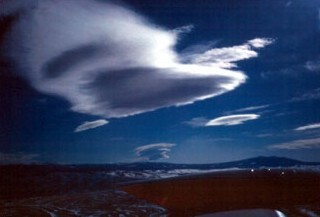 What are the flight conditions in lenticular clouds? Generally the lenticular area will be quite smooth. The only danger is the magnitude of the sustained updrafts and downdrafts. 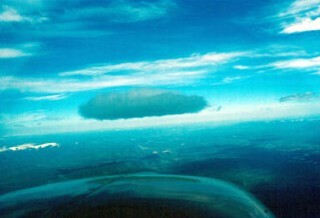 Usually individual lenticulars are composed of ice crystals, but when they are composed of super-cooled water droplets watch out for severe icing conditions. Normally the rotor clouds is centred beneath the lenticular cloud. Most often it extends anywhere from ground level to mountaintop level, but is frequently observed up to 35,000 feet. Destructive turbulence from the rotor rarely exists more than 2,000-3,000 feet above mountaintop level. The rotor is described as a "dark, ominous-looking cloud with a rotating appearance." If it forms near the ground where it can pick up dust and debris, it is dark and ominous looking, but more often it looks similar to a fair-weather cumulus. 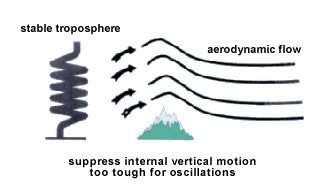 Turbulence is most frequent and most severe in the standing rotors just beneath the wave crests at or below mountaintop level (visualization is helpful where there is insufficient moisture to form the rotor or the lenticular). The rotor area forms beneath the lee wave where a large swirling eddy forms. Sometimes with an inversion (normally stable air), turbulence succeeds in overturning the air in the stable layer. Once warm air is suddenly forced beneath colder and denser air a vigorous convection is set up in an attempt to restore normal equilibrium. This makes the roll cloud a particularly turbulent hazard. If the top of the cloud is rotating faster than the bottom, avoid the area like the plague. The most dangerous characteristic of the standing wave is the rotor. The rotor can be assumed to exist whenever a mountain wave forms, but a cloud will not always form to alert you to its presence. Avoid the area where the rotor will form with visualization. Often the three conditions that must exist to form a mountain wave will exist (perpendicular wind flow, increasing wind velocity with altitude, and a stable air mass layer or inversion) ... but there is insufficient moisture for the wave clouds to form. This is called a dry wave. All of the updrafts, downdrafts and rotor turbulence exists, you just can't see the clouds. You must use visualization. Just because a mountain wave exists, it is not a sure sign that your flight must be delayed or cancelled. 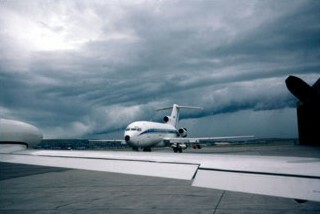 The degree of stability can be determined from pilot reports or by a test flight. Altitude 50 percent above the terrain - Turbulence caused by extreme mountain waves can extend into all altitudes that you might use, but dangerous turbulence can usually be avoided by clearing the mountains at least half again as high as the height of the mountain. In Colorado there are 54 peaks over 14,000-foot elevation. Does this mean we have to fly at 14,000 plus one-half (7,000) or 21,000 feet? No, use the base of the terrain to begin measuring. For example, if the surrounding terrain is 10,000 feet and the mountaintop is 14,000 feet, use one-half of the 4,000-foot value and fly 2,000 feet above the mountaintops. Approach at a 45-degree angle - The rule-of-thumb of flying half again as high as the mountain is designed to reduce the risk of entering the turbulent rotor zone, but it does not necessarily give you a sufficient margin to allow for height loss due to downdrafts. You must have an escape route. 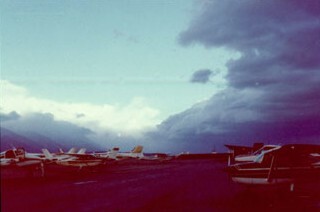 Avoid ragged or irregular-shaped lenticulars - Ragged and irregular-shaped lenticulars can contain the same turbulence as the rotor area. Climb in lift - Dive in sink - By diving in sink, rather than trying to maintain altitude, the airplane is exposed to the effects of the downdraft for a lesser amount of time. Even though the rate of descent will likely be double or more the rate of climbing at the best rate-of-climb airspeed, the airplane will loose less altitude overall. Avoid the rotor - If rotor clouds are not present, visualize the area of the rotor and avoid it. Visualize the wave length - When flying parallel to the wave, fly in the updraft area.